Are you a clinician interested in navigating your academic career? The Training and Research Academy for Clinical and Translational Science (TRACTS) is a training program for early career faculty who have an interest in pursuing clinical/ translational research as a major component of their careers. The goal of TRACTS is to prepare clinicians for an expanded role in health sciences, including further research career development. TRACTS is designed to have a small footprint on clinical schedules. TRACTS participants enter the program with a variety of research interests but are often new to UF. After one or more interviews with TRACTS staff, they will identify potential mentors from faculty within the Health Science Center as well as relevant academic units. The TRACTS model represents a significant change to a long-standing program formerly known as the Advanced Postgraduate Program in Clinical Investigation (APPCI), which was originally supported through the NIH Clinical Research Curriculum Award (K30) program from 1999-2009. Under the CTSI since 2009, the program was refocused, reconfigured and renamed in 2014 as TRACTS targeted specifically to research-oriented junior faculty with high potential for a productive clinical/ translational research career. Candidates must be faculty with a full-time appointment within a UF department or a fellow or post-doc who plans to pursue a full-time faculty position upon completion of training. Candidates with PhD or another doctoral degree in a clinical discipline such as clinical psychology, nursing, clinical genetics, speech-language pathology, audiology or rehabilitation are also eligible. Although US citizenship is not required, the candidate must be able to demonstrate that he/she will be eligible for US career development grants at the time of completion of the program. Individuals on student visas are not eligible. Former PD/PIs on NIH research project (R01), program project (P01), center grants, FIRST Awards (R29), sub-projects of program project (P01) or center grants, other career development awards (K–awards), or the equivalent are not eligible. Successful candidates will be those identified by their departments as future translational researchers. Because TRACTS does not provide salary support, the time demands of the program are minimal. However, long-term success requires that some portion of time be dedicated towards mentored research. Thus, the participant and his/her department need to negotiate protected research time. Once candidates obtain supervisory support, they need to contact Maria Gavidia (mgavidia@ufl.edu), TRACTS program coordinator, to arrange an interview with TRACTS director Ron Shorr, MD, MS. Admission to TRACTS is based on the interview with specific attention paid to how focused the candidate’s research interests are. In addition, Dr. Shorr may discuss the candidate’s career trajectory with relevant supervisors to assure concordance. One or more interviews may be required. More developed research ideas lead to better mentor identification and a higher probability of long-term success. 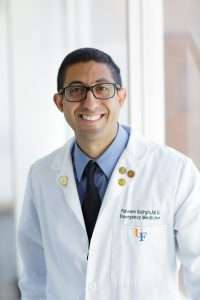 Dr. Shorr has a long track record and passion for mentoring and has been engaged in physician academic development programs at UF since his arrival in 2007. Dr. Shorr has extensive experience conducting both observational and experimental studies on healthcare safety and quality, particularly in older adult populations.